The sales industry is fabulous, because your results are directly related to your effort. We help you learn how to work smart, not hard. The Laws of Sales Success creates a successful plan for achieving your goals, and reaching your dreams. The course is based on Og Mandino's book, "The Greatest Salesman in the World" We break down this material, teaching the secrets behind the words, and show you how to harness this information. 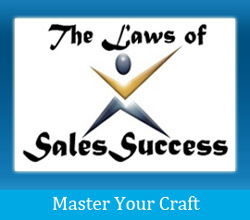 Powerful changes in your life are right around the corner with The Laws of Sales Success. You'll learn proven, but easy ways to make twice the money you are making now, have more happiness in your life, and greater enjoyment of your free time. We work hard, play hard and help you discover the best YOU possible. This is accomplished 90 minutes at a time per week for 12 weeks. This plan is going to change your LIFE! Imagine waking up with the burning desire to succeed, and that desire coming naturally! The Laws of Sales Success will not only help you find that passion, but it gives you a design for maintaining great performance and success. Action is the first step, so sign up for the earliest available class. I've been in the timeshare business for 20 years in Los Cabos. The Laws of Sales Success is well past due in my life! The course doesn't try to teach you all those sales techniques and closes we all know already. It goes way beyond that into "how to identify failure, and more importantly, how to build success". It takes you into your subconscious on how to change bad habits to good habits. All of us going through the process are finding "hidden selves" that we never could find. It's the most uplifting course I've ever attended. I see great things ahead for myself.